Donna Carver | Morrow County Sentinel Owner Leslie White, left stands in front of her new store “The Comeback Kid” Shown with her is friend Roberta Day who is helping her prepare the store for the Ribbon Cutting slated for July 3 at 5:00 pm. A new retail business is coming to downtown Mount Gilead. The Comeback Kid will be located at 37 S. Main St. and will host a Ribbon Cutting on July 3, 2015 at 5:00 pm. 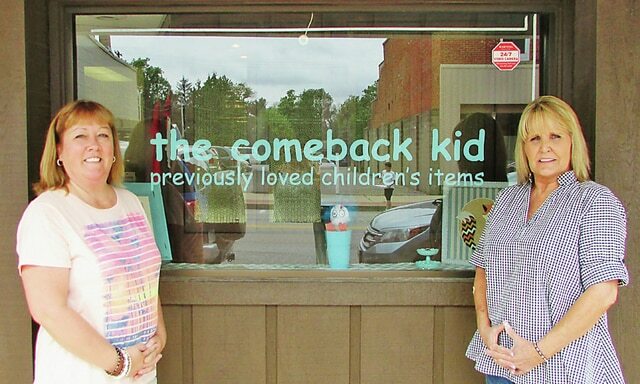 The Comeback Kid is a children’s retail shop featuring new and gently used children’s items. Hours of operation will be Tuesday through Friday 10 am to 6 pm, Saturday 10 am to 1 pm , closed Sunday and Monday. At that time, she had young twin boys and was offered a full time position at a job she enjoyed so closed the business which was then called Coverall kids. White says she loved having the retail store and wanted to try again now that her sons are teenagers.